We have since moved to a much smaller and more diverse country town in northern Israel, with Jews of all shapes and sizes. A good portion of the folks here are committed to Shabbat observance, while an equal-sized portion are not. There are no “oy yoy yoy”s on loudspeakers, no instant cessation of cars driving on the streets Friday nights; but there is a very special and authentic Jewish energy that pulses through this place. That pulse just about smacked me over the head recently, when a holy Jew crossed my path and reminded me that being a Jew goes far beyond what we look like or how we dress. I was out for a little Shabbat stroll with my kids. We were headed for the park down the hill, and a young, shirtless man was walking towards us. Even from afar, he looked a little scary. He was heavily tattooed, had a large chain swinging from his pocket, and was smoking a cigarette. He walked with a swagger that gave off an “I dare you to pass judgment on me” vibe. Indeed, this young man had big, bold, capital Gothic letters that spelled the words “Jew Forever” tattooed across his chest. I must have been in information overload when we actually passed each other, because I don’t remember if we exchanged “Shabbat Shaloms’” or not . . . but something was exchanged, something I won’t be forgetting any time soon. For the record, tattooing is explicitly forbidden according to Jewish law. If it is possible to put that aside for a moment, I would like to assert that this man’s commitment to his Jewish identity absolutely amazed and inspired me. I wish I’d had the presence of mind to speak to him and ask him for his backstory. I can only imagine what inspired such a wanton expression of Jewish pride. But, as the Baal Shem Tov teaches, we are meant to learn from the things that G‑d puts in our paths. I learned several things from that tattooed man. Being a Jew is way more about who you are than what you look like. I understood then, in a way that I hadn’t understood before, how deep my commitment needs to run. There is an unfortunate word that is part of modern Israeli vernacular. The word is chiloni. (I’m not going to spell it phonetically for you, because I don’t want you to say it.) It’s a word that is intended to describe any Jew who doesn’t adhere to Jewish law, who doesn’t keep Shabbat or kosher, for example. The Jewish people were chosen by G‑d to be an am kadosh, a holy nation. All Jews, regardless of upbringing or behavior, were given uniquely Jewish souls in order to fulfill that mission. The Alter Rebbe, the first Chabad rebbe, writes in hisTanya that a Jewish soul is “an actual piece of G‑d.” There is nothing that a Jew can do to destroy his soul, his actual piece of G‑d. It is an impossibility. So, to call one’s self, or another Jew, a chiloni is downright blasphemy. Ironically, had this inked Jew studied a little Tanya, he would have known that “Jew forever” is already tattooed in his DNA. 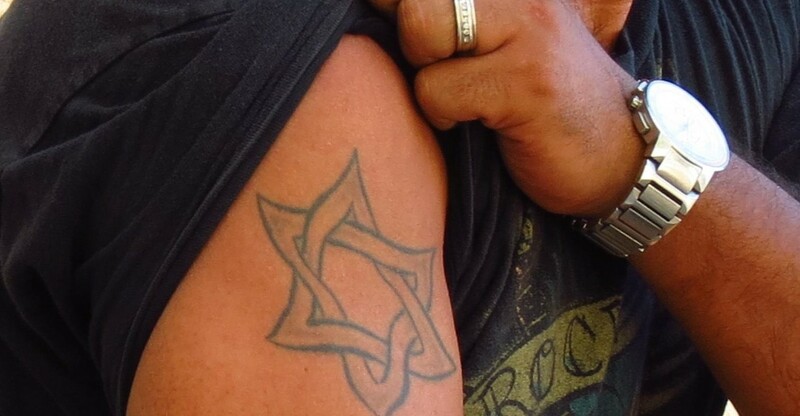 While there may be folks out there who opt to look at that tattooed Jew with disdain or pity for his blatant disregard for Torah law, I have a feeling that G‑d sees things from a much wider lens. I think it was precisely his holy Jewish soul that inspired his pectoral declaration. While his medium of choice may be misguided, I imagine that his intention is very well received on High. We now are preparing to celebrate the holiday of Rosh Hashana. Our sages explain that while we camped at the foot of the mountain waiting to receive the Torah and accept G-d’s kingship in this world, we were k’ish echadbelev echad, like one man with one heart. We looked different from one another, we chose different words to express ourselves, had different ideas about how to speak with our children and how to cook a steak . . . but we knew who we were: one, big, fat, inseparable family. May this new year bring us the strength to push past the outer layers that threaten to separate us, and allow us to see straight into each other’s core—to the place inside all of us that is all G‑d, all the time.